Chef Hosea Rosenberg prepares a gourmet marijuana-infused pudding, the final step in preparation from here is letting the dessert cool and thicken, either on a bowl of ice or in a refrigerator. 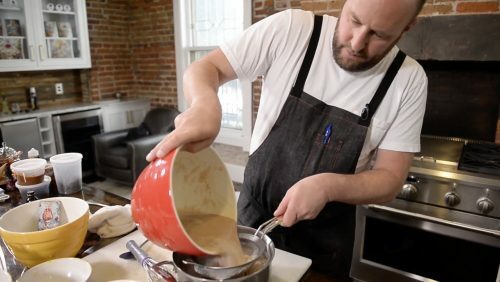 Editor’s note: The Cannabist’s debut video recipe series “Infused” with award-winning chef Hosea Rosenberg is sponsored by Binske, purveyors of marijuana-infused cooking oil, honey and chocolate. 1. Reserve 1 cup milk and 1/2 cup sugar. 2. Put rest of milk and sugar in pot and slowly bring to a boil over medium heat. 3. Combine reserved sugar, cornstarch, cocoa powder, and salt, whisk to combine. Add reserved milk and whisk until smooth. Add egg yolks and whisk until smooth. 4. When milk and sugar come to a boil slowly add 2-3 cups of hot liquid to egg yolk mixture while stirring constantly to temper eggs. 5. Add everything back into milk/sugar pot and bring to boil over medium-high heat, whisking frequently. Once mixture comes to a boil whisk for 1 minute until thick. 6. Pass mixture through mesh strainer and then whisk in butter, chocolate and vanilla extract. 7. Place bowl in water bath to cool. • The best quality chocolate will result in the best pudding – don’t skimp on quality. • Tempering eggs is a critical step — don’t let the eggs overcook. • Do not overcook pudding — it will coagulate. • Chill overnight for best results. • Garnish with caramel sauce, berries, cookie crumbs, nuts, whipped cream, or anything that you like — this pudding is versatile. • Put in small mason jar to take on the go.